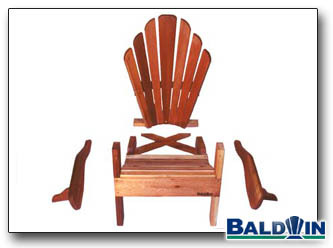 When you order a chair from Baldwin Lawn Furniture you don't get a kit or weekend project. We start with a fully assembled, sanded, and sealed piece of furniture. All we do is take the Backrest and Arms off, Screw the Backrest on, then screw the Arms on! Since we use square drive screws, we send you a Baldwin Square Drive Screwdriver. Check out the next day shipping program and the assembly instructions.